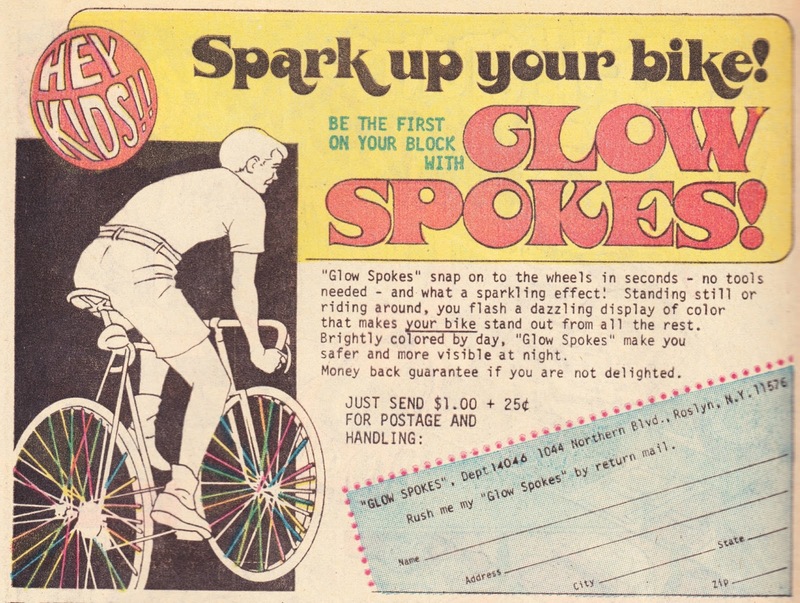 Papergreat: Glow Spokes will make your bicycle totally rad! HEY KIDS!! Spark up your bike! Be the first on your block with Glow Spokes! "Glow Spokes" snap on to the wheels in seconds — no tools needed — and what a sparkling effect! Standing still or riding around, you flash a dazzling display of color that makes your bike stand out from all the rest. Brightly colored by day, "Glow Spokes" make you safer and more visible by night. Money back guarantee if you are not delighted. One dollar was no small investment 43 years ago, especially when all it bought you was a few strands of colorful plastic. It would be the equivalent of more than $5 today. For bits of plastic that will probably just end up in the Great Pacific Gyre. But, hey, it made you safer at night, so maybe it was a good investment. "We didn't need no stinkin' glow spokes. We attached playing cards to our back wheels with clothes pins so they'd sound like a motorcycle...well, to a kid it sounds that way. The ad shows a teenage boy with Glow Spokes on his wheels and talks about their 'dazzling display of color.' But I'd be willing to bet that any boy who put these on his bike would be taunted so unmercifully that the things would be in the trash by the end of the day." Yep. We used playing cards or, even better, common Topps cards featuring stinkin' New York Mets. Anything to make our bikes cooler as we sped home to watch Battle of the Planets. 1. "Sword of Sorcery" featured tales of Fritz Leiber's Fafhrd and the Gray Mouser, a pair of iconic fantasy heroes who almost certainly never used Glow Spokes.